MURMANSK – Preparations are now in full swing at the former naval base Gremikha in Russia’s Murmansk Region to start evacuating first containers with spent nuclear fuel (SNF) from first-generation submarines to a reprocessing destination at the Ural-based chemical combine Mayak – a major indication that Russia is finally owning up to the pressing problem of environmental rehabilitation of the areas it has used for decades to store nuclear waste from its naval fleet. “The reason this operation conducted by SevRAO is so unique is that this is in fact the very first removal of SNF from such sites in the Murmansk Region,” said chief engineer with the Murmansk-based civilian nuclear icebreaker operator Atomflot, Mustafa Kashka, in an interview with Bellona Web. SevRAO, the entity Kashka referred to, is a nuclear and radioactive waste management facility operated under the purview of Russia’s state nuclear corporation, Rosatom. According to Andrei Zolotkov, board chairman of Bellona’s Murmansk branch, the start of removal operations in Gremikha shows that by coping with the task of putting to final rest at least part of its ruinous Cold War legacy, Russia is moving in the right direction. "We can now positively say that not only is Russia solving and can solve the problems of the former naval base at Gremikha, but it will also in the near future start serious works in Andreyeva Bay,” said Zolotkov. Gremikha, a restricted-access area under SevRAO jurisdiction, is located on the eastern shore of the Kola Peninsula and is the second largest of the two onshore facilities used by the Russian Northern Fleet to store its radioactive waste. Andreyeva Bay is the other naval nuclear waste dump, located 45 kilometres west of the Norwegian border. Over the years, Gremikha has accumulated around 800 spent nuclear fuel assemblies from pressurised-water reactors (PWRs) that powered first-generation Soviet submarines – or around 1.4 tonnes of spent nuclear fuel rods – and six reactor cores with liquid metal-coolant taken out of Alpha class submarines. In both Gremikha and Andreyeva Bay, the Northern Fleet operated two pool storage facilities for spent nuclear fuel. After both facilities suffered accidents and were taken out of operation in the 1980s, SNF was placed in temporary dry storage facilities and containers in Andreyeva Bay and Gremikha onboard special nuclear support ships, or was simply left in the reactors of the retired submarines laid up at the bases. Radioactive waste is stored both in Andreyeva Bay and Gremikha, as well as at shipyards, naval bases and special tankers located on the Kola Peninsula and in the northern city of Severodvinsk. The first SNF was delivered to Gremikha in the early 1960s after Russia’s first nuclear-powered submarines underwent their first refuelling. These were 112 containers of the type TK-6 (or TK-11) that held 672 spent nuclear fuel assemblies. For more than 40 years, this waste was hoarded up at an open-air storage facility – literally, under the open sky – posing a grave radiation threat. The main operations site that took delivery of both the SNF from the PWR reactors and the liquid metal coolant reactors was the dry dock chamber cut out in solid rock on the shore. Here, all SNF management operations were taking place after delivery, including repairs and fuel transshipment. Design-wise, the storage facility for the SNF generated in PWRs – Facility 1 – represented four stand-alone cooling pools connected with a common technological operations block. Each pool had a capacity of 70 cubic metres and contained spent nuclear fuel assemblies from two first-generation submarine reactor cores. In 1984, after a leak was discovered at the facility, all four pools were drained, SNF was unloaded from three of them, and the fourth was chosen to accommodate the 95 spent nuclear fuel assemblies that were too damaged to be transported to Mayak for reprocessing. According to Atomflot’s Kashka, before the latest evacuation works started, as long as one hour spent at the site in Gremikha was equivalent to receiving a yearly dose of radiation. Today, he says, this is a site with normal radiation levels and personnel are safe to work there without taking enhanced precautions against severe irradiation risks. “Thanks to SevRAO’s works, the radiation environment at the site where the SNF was stored has improved, without exaggeration, by more than 1,000 times,” Kashka told Bellona Web. Besides the SNF, in storage at Gremikha are also substantial quantities of radioactive waste: various equipment, used ion-exchange materials and other tools, as well as storage containers – all bearing very high levels of radioactive contamination. This is why works were performed at Gremikha to decrease the off-the-chart radiation levels. “Now, it is possible to visit the site frequently and work there in a normal way,” Kashka said. Despite Kashka’s exuberance, SevRAO’s track record in dealing with radioactive waste in Gremikha and Andreyeva Bay is far from stellar. In one notorious incident in July 2003, 12 SevRAO workers suffered various radiation doses at Gremikha while cleaning up an undocumented storage site littered with solid radioactive waste. The irradiated workers were sent to a medical examination only a month after the incident. Furthermore, in an attempt to hush up the incident, the management overseeing the Gremikha’s branch at SevRAO fired three of the workers and proposed to the others that they resign. Bellona’s sources in Gremikha confirmed at the time that cleanup works at SevRAO had been conducted practically with no radiation safety control. The woman who was responsible for monitoring the site’s radioactivity levels – which were so high they pinned the needles of the radiation measurement instruments she was using – spoke out against the dangerous conditions, but her protest hit a wall of neglect and inaction. According to Kashka, prior to the SNF evacuation procedures, SevRAO and the Moscow-based Russian Kurchatov Nuclear Research Institute spent two years assessing the condition of the SNF in storage to make sure it was safe to ship it off to Mayak. Last year, 85 percent of all PWR-originated SNF in storage was given a green light for transport. Before the end of 2008, 294 fuel assembly channels were slated for shipment to Mayak. But, located 350 kilometres off the Kola Inlet near Murmansk, Gremikha is not connected to the rest of the peninsula by roads, which leaves boats and air travel as the only means to reach it. For the first leg of the journey to reprocessing, SNF will be taken out of Gremikha by sea. The Serebryanka, a specially upgraded tanker operated by Atomflot, will deliver the SNF containers to Murmansk. There, they will be loaded onto a special block train to travel across the country to Mayak, in the Chelyabinsk Region in the Urals. “The fuel is already prepared for the transport; it is on the Serebryanka. We are now expecting the last of the authorisation papers to see the ship off to its voyage,” Atomflot’s Kashka said. Built in 1974, Serebryanka is intended, for the most part, for the loading, temporary storage, transport, and offloading of liquid radioactive waste (LRW). In 1987 to 1990, an experimental LRW decontamination system was undergoing testing on board the vessel. Since 1996, the Serebryanka has been used to collect and ship LRW accumulated by the Northern Fleet to Atomflot in Murmansk for reprocessing. According to SevRAO general director Valery Panteleyev, the first six TUK-18 containers with SNF are slated for transport on board the Serebryanka in January this year. The second stage of the evacuation process is scheduled for the summer of 2009. “We are now beginning to remove the undamaged fuel, then, only the “problem” [SNF] will remain,” Panteleyev said in an interview with Bellona Web. The Gremikha operation may be that push that has long been needed to spur ahead the remediation works at the Northern Fleet’s other nuclear dumpsite, Andreyeva Bay. “There is, of course, much more [SNF] in Andreyeva Bay, but its condition is better there, and therefore, it will be easier to manage it,” Kashka said. SNF, unfortunately, has been only part of Gremikha’s woes. The former naval base also boasted the largest collection of the dregs of Russia’s retired submarines. The base made international headlines on August 30th, 2003, when one of its rust-bucket subs, the 40-year-old K-159, sank in the Barents Sea while being towed to the Polyarny shipyard near Murmansk, killing nine of the 10 crew members on board. The sub, which was still loaded with spent nuclear fuel, sank in 240 metres of water. Environmentalists say that, with so much water pressure bearing down on the reactor compartment, eventual radioactive contamination is just a matter of time. Five years later, however, the submarine has still not been secured or raised to surface – despite an abundance of promises as well as viable project ideas to do so. In early 2003, there were 16 nuclear submarines containing their spent nuclear fuel still moored at Gremikha’s piers. As of November 2004, when Bellona compiled information on the dangers of the potential sources of radiation at Russia’s Northern naval sites for the organisation’s report on the Russian nuclear industry, Gremikha was housing several inactive nuclear submarines; 767 spent fuel assemblies; six liquid metal cooled reactor cores; 300 cubic meters of solid radioactive waste; and 1,960 cubic meters liquid radioactive waste. In 2006, however, Gremikha was finally relieved of the last of its derelict nuclear submarines contracted to be removed from it for further dismantlement by the Dutch firm Dockwise under the aegis of the Arctic Military Environmental Cooperation (AMEC) group. This transport was part of a larger project by Dockwise to take a total of three Russian nuclear submarines, with their nuclear fuel still on board, to dismantlement points in Russia’s Northwest. Since 2002, Russia’s predicament with dealing with the radioactive waste from its vast arsenal of decommissioned submarines, as well as other radioactive hazards, has been receiving steady attention from the international community. In June that year, the world’s wealthiest nations made $20-billion pledges to that end at the Kananaskis, Canada, Group of Eight summit. 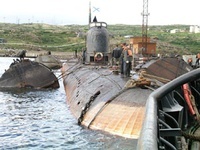 A year later, Bellona Web reported that the international cash spigots finally opened for Russia: More than $130m was donated in the first several months of 2003 alone toward Russia’s efforts to decommission its retired and rotting non-strategic submarines, as well as for nuclear cleanup and the development of safer methods of storing SNF in both Northwest and Far East Russia, where nuclear submarine bases operated by the Pacific Fleet are located. The European Bank of Reconstruction and Development (EBRD) has also been instrumental in forwarding environmental remediation projects in Russia’s Norwest, particularly at Gremikha, which the bank sees as a priority site. In 2004, with the financial help from the EBRD, Russia started working on a so-called Strategic Master Plan to address the nuclear waste issues in the Northwest. The Master Plan was developed as a compass for the formulation of federal target programmes to underpin the adoption of strategic decisions and prioritising them. The plan also serves as a foundation for choosing specific installations as beneficiaries of international funding earmarked for the environmental remediation projects in the area and encourages the mass media to evaluate how effective this international funding has been. Yet, in May 2008, a Murmansk meeting of environmentalists and nuclear industry experts revealed that the Master Plan was lagging behind its targets and the work which had been completed accounted for only a minor percentage of the tasks still ahead. Whereas submarine decommissioning projects were practically finished, some 85 to 90 percent of the decommissioning work remained for nuclear service vessels – ships that were used to fuel and de-fuel submarines at sea, and which are highly contaminated. Almost nothing had been done to decommission surface vessels with nuclear power installations, and some 95 percent of this work remained. Projects to construct temporary nuclear waste storage facilities at Andreyeva Bay and Gremikha were only 10 to 20 percent along the road. Transporting spent nuclear fuel out of the region had only been completed to about 40 percent, and only 10 to 20 percent of radioactive waste had been hauled out. The cost of liquidating all traces of the Cold War in Northwest Russia will be about €2 billion, a statement made at the meeting concluded.